On Saturday, 13 October 2012, members of Open Shuhada Street, the UCT Palestine Solidarity Forum and the general public protested outside Wellness Warehouse on Kloof Street in Cape Town to demand that it end its illegal sale of AHAVA cosmetics and show solidarity with the oppressed Palestinian people. Around 60 people of all walks of life, faiths, race and backgrounds protested for two hours. The message was clear and simple: that Wellness Warehouse must stop profiting from the illegal and immoral occupation of the Palestinian West Bank by selling AHAVA. The protest showed very clear increasing support and local and international media attention for the campaign. 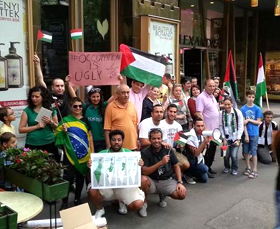 On 1-2 June 2012 activists from Campagne BDS France held protests outside Sephora shops in five cities: Paris, Lille, Orleans, Strasbourg and Lyon. The protesters called on Sephora to stop stocking Ahava and Yes to Carrot cosmetics. Below are videos from the Paris and Strasbourg actions. 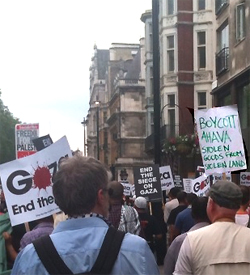 Palestinian supporters celebrate as Ahava forced out of Covent Garden, London, by protests. Translation of text: The perseverance of Mulhouse activists has paid off. The manager of Sephora's store in Mulhouse was convinced by the information given to her about Ahava's products, which are made in the illegal settlement/colony of Mitzpe Shalem in the Palestinian West Bank and labeled "Products of Israel." Not wanting to encourage colonization, and not wanting to lie to her customers, she obtained permission from the regional management of Sephora to pull Ahava products from her store's shelves. See the video for more details. Latest in the series of two weekly protest demos outside the Ahava shop in London, which markets so called "Israeli" goods which are in fact goods made in an illegal settlement on stolen Palestinian land with chemicals stolen from the Palestinian territory at the north western corner of the Dead Sea.. This explains Ahava's relactance to go to court against pro-Palestinian activists as they know they are involved in the illegal sale of stolen goods. 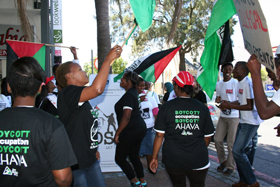 On Saturday, 2 October 2010, Open Shuhada Street and the University of Cape Town Palestine Solidarity Forum protested against Wellness Warehouse demanding that they stop selling Ahava products. Ahava products are manufactured in an illegal Israeli settlement in the Occupied West Bank, yet label their products "Made in Israel". According to international law and even the Israeli Supreme Court, the West Bank is not part of Israel. Apologists for Israeli human rights abuses tried to disrupt our protest, but we succeeded in carrying out a peaceful protest and making our voices heard. 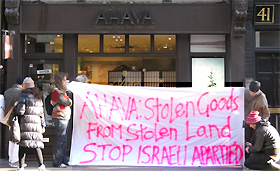 Ahava protest outside Sephora in Paris. Sephora ! Pas de beauté sans liberté ! Demonstration on July 3, 2010 by Palestine solidarity campaigners outside the Israel Ahava shop in London's Soho district; these protests are being held every two weeks and their success has generated a regular Zionist counter demo. "Boycott AHAVA/Stolen Goods from Stolen Land"
The Dutch Stolen Beauty Bathrobe Brigade had a Valentine action on Saturday 13th of February, 2010, in the Center of Rotterdam. 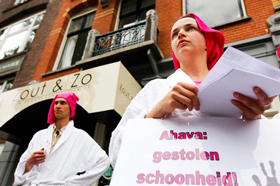 Despite the cold, a group of women in bathrobes with pink towels on their heads, and broken hearts in their hands, walked through the center of Rotterdam to inform people that there is NO LOVE in Ahava. Their message was not to buy any AHAVA products as Valentine gift for beloved ones, because there is NO LOVE in a company profiting from occupation. Montreal action outside "The Bay" store calling for the boycott of Ahava products. Members of Middle East solidarity groups Tadamon! , Solidarity for Palestinian Human Rights (SPHR) and the Québec BDS (Boycott, Divestment and Sanctions) Committee demanded The Bay to take products of Ahava Dead Sea cosmetics off its shelves. Announcement of launch of Canadian AHAVA boycott: Unmask Apartheid This Hallowe'en!